PLACING anything in the path of a high-power laser presents certain risks, and that includes the expensive optics that are part of the experiment. While these may not be damaged by the laser itself, they may be in the path of debris created when the laser hits the target. Optical Surfaces manufactures debris shields to protect valuable reflective or refractive final optical elements. 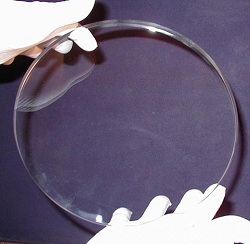 Using a range of glasses including fused silica and BK-7, both of which provide high transmission across a wide range of wavelengths from the UV to the near-IR, the company says it can supply specified debris shields of virtually any shape and thickness. The company’s craftsmen work to meet the twin demands of a debris shield: that of producing a precision wavefront on a flexible window, and making a shield with a high diameter-to-thickness ratio. Shields can be economically made up to 600mm diameter, with typical wavefront error of lambda/10, and surface finish of 40/20-10/5.